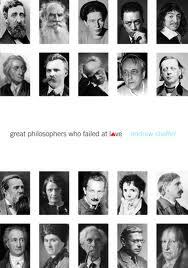 I came across Great Philosophers Who Failed at Love by Andrew Shaffer today when I went to the library to sign-up for the summer reading program. The title peaked my curiosity and I quickly read the book this evening as it is not very long. This clever non-fiction book briefly shares the love lives of many famous philosophers dating back to 350 B.C. Many of the men and women showcased in this book not only had their own philosophical viewpoints, they also had their own definitions of love. I was amazed at how many of these famous folks were unfaithful to their significant others. The history dispensed in this tiny little book is fascinating and I enjoyed sharing a summer evening with it. Love – even the “experts” don’t always get it right! This entry was posted in Uncategorized and tagged Andrew Shaffer, Books, Great Philosophers Who Failed at Love, love, Philosophy. Bookmark the permalink.